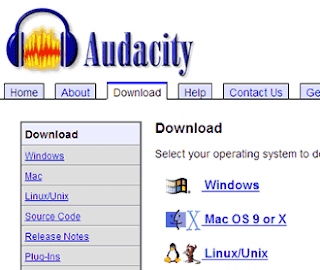 Audacity audio editor is a free and reliable audio recording and editing software for Mac OS, Windows(10/8/7/Vista/XP), GNU/Linux and other supported operating systems that offer more features than you’ll possibly have the time to test. Audacity audio editor first version was released in 2000 and it has been the leading and easy-to-use cross-platform audio editor and recording software that would ease your multi-track recording activities. If you landed here in search of good sound/audio recorder for pc, Audacity free download is available for you so look no further, Download audacity-win-2.2.0.exe for device here. Audacity makes it easier for you to record audio, export, cut, copy and paste sounds, and even add effect like echo, amplification and noise reduction free of charge. Audacity is not like other recording tools that require an upgrade before using their complete features, all services offered by Audacity software are free, you don't have to pay a dime before using the open-source program, Audacity free audio editor and recorder. Audacity audio editor has friendly UI and it supports almost all audio files which means you can always rely on this audacity free download to edit even the most obscure file types - Audacity can handle them with just a click. Waveform colorways - This option allow users to manually change the colorway of the waveforms displayed in your project. The setting is per track and not per project so you can have multiple colorways in the same project as in the image below. 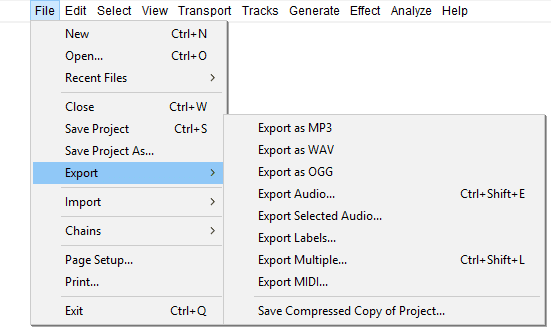 “Save Other” reverts to "Export" in the File menu - This option allow users to easily select the mode of exporting audio file in various formats as show in the screenshot below. Bugs fixes - Some problematical bugs in Audacity got fixed for greater performance, you would no longer experience Crash while applying certain chain files, Preview fails when selection extends before zero, Auto-scroll stopped working in the previous version 2.2.0, error while opening a second project from Mac's finder produces a second inaccessible instance of Audacity audio editor. For more details visit Audacity official website for more release notes. 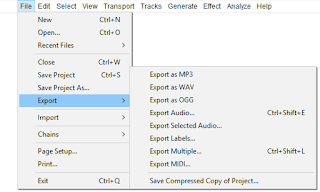 To enjoy all the features of Audacity free audio editor and recorder, there some additional files (pug-ins and libraries) you need to download such as FFmpeg import/export library, LADSPA plug-ins 0.4.15 installer, and LAME MP3 encoder. Check out the Audacity System requirements here. Note; these are often not the latest version of Audacity. To build Audacity yourself, download the source code.